Despite the fact that the Bible describes him as having “skin liken unto the color of Bronze” and “hair liken unto lamb’s wool,” America loves itself some Seasonless Jesus. When he’s not preoccupied with being “the reason for the season” every Christmas morning, you might spot him at your friendly neighborhood house of worship extolling the joys of spin class or on Netflix healing the sick while taking periodic breaks to kiss golden retrievers on the mouth. He’s white, dammit. And that’s the end of that. As such, when he’s not chasing Academy Awards on behalf of Jim Caviezel—or his latest incarnation Joaquin Phoenix—he’s at the beck and call of bigots like Stephanie Borowicz, who blow up his phone and break his figurative glass in case of emergencies—like Muslims being sworn into public office. Borowicz decided to deliver a prayer to the 9-pound, golden diapered, baby Jesus in the Gucci lined manger, a prayer that would have got her smacked upside the back of her head in a black household for playing with God’s name. In the most passive-aggressive way possible, Borowicz decided that she was going to turn Jesus into a fight against Islam during “a 100-second ceremonial invocation that some of her colleagues decried as an offensive, divisive and Islamophobic display shortly before the legislature swore in its first Muslim woman,” The Washington Post reports. “God forgive us — Jesus — we’ve lost sight of you, we’ve forgotten you, God, in our country, and we’re asking you to forgive us,” Borowicz said. She followed this up by quoting the Bible’s second book of Chronicles that implores God’s followers to “turn from their wicked ways.” Oh, she also found time to praise President Trump’s unwavering support of Israel. According to the Post, by the time Borowicz was done with her missive, she had used Jesus’ name some 13 times. She also “mentioned ‘Lord’ and ‘God’ another six times each and referenced ‘The Great I Am’ and ‘the one who’s coming back again, the one who came, died and rose again on the third day,” The Post reports. One member can be heard shouting objections towards the end of her prayer. Speaker Mike Turzai, a fellow Republican, had to hit her elbow to let her know that was enough. 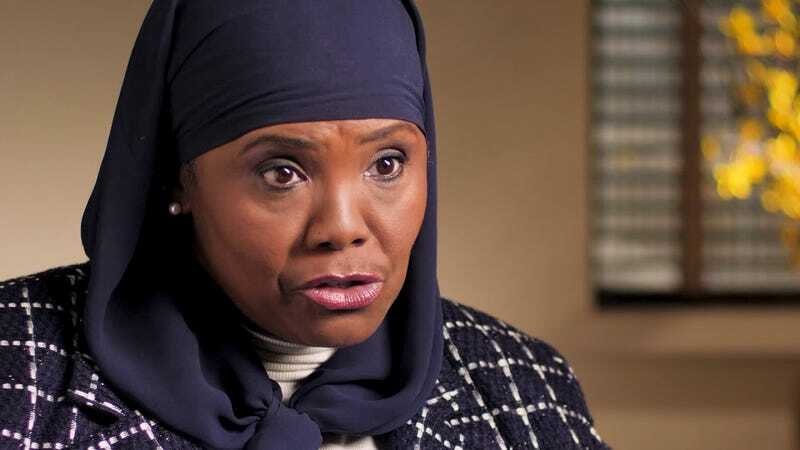 “It blatantly represented the Islamophobia that exists among some leaders — leaders that are supposed to represent the people,” Johnson-Harrell told the Pennsylvania Capital-Star on Monday. “Never have we started out with a prayer that divides us,” said the chamber’s top Democrat, Rep. Frank Dermody, speaking from the House floor. “Prayer should never divide us. It should bring us together,” The Post reports. Rep. Jordan Harris criticized Borowicz for “weaponizing” her religion. A local reporter asked Borowicz if she planned to apologize. What do you think she said? You’re right. Turzai later noted that when the House invites religious leaders to lead the prayer, they are sure to point out that they need to respect all religions. Apparently that caveat didn’t make its way to lawmakers. The saddest part of this is that this historic and special moment for Johnson-Harrell was tainted with a weaponized Jesus, and that’s not how Jesus rolls, as every knows that Jesus loved everyone.